After some research, I just placed an order for a set of the T31's. One bloke strongly recommended the GT version for the VFR800, which I did not purchase. Has anyone else tried the GT version? Might be a better bet on the 1200. I got the GT spec for mine. VFR1200F, I'm not light at 212 no gear, the 7th gen is fairly heavy and I wanted to plan for worst case weight of loaded down with bags. I dug around a lot for information on weight but couldn't find much. I will say that the guy I bought this bike from is a lifelong moto nut and was an AMA Pro privateer and he had GT's on it - helped make my decision to get them. What makes the GT version different? Is it just a harder strip in the middle or a stiffer carcass? As as far as weight goes the 7th gen is only slightly heavier than the 800s. Maybe we should all be using the GTs? I really wish manufacturers would clarify this a bit more. If you’re on a huge touring bus like the Pan European, or a lightweight rapier like the CBR600RR it is clear which side of the fence you’re on. If you’re on a heavy middleweight like the VFR it gets trickier. It's a bit of a toss-up and some guidance from the manufacturer would be nice. Stiffer sidewalls (carcass) seem to be the difference from what I gather. For heavier sport tour bikes like the Yamaha FJR, Honda ST and the like. So the 7th gen would likely be a good candidate. I like to go distance solo riding so my 5th gen would be fairly loaded up for that. But I'm a lighter guy at 160lbs. It was a toss up but I went for the non-GT version. 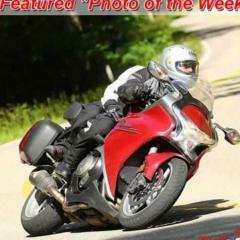 The write up I read was on the other VFR owner's site. The guy had an 800 VFR but he was a much larger person and heavily loaded the bike up for touring with camping involved. So distance gear plus a tent, sleeping bag and all the associated outdoor stuff. He tried both versions and much preferred the GT. This decision might cause some sleepless nights but if you take a step back, lots of bike tires do not have a beefier version so a decision is a non-issue with them. My last bike was an FJR and I used it for long distance touring, so substantially loaded plus the wife on the back (she liked to collect rocks as souvenirs) and my tires were not the GT version of what ever brand they happened to be. The bike performed like a star. I believe the trick might be to take a look at some of the other manufacturers besides Bridgestone. IIRC, they give a recommendation. I'll look later today. The more I think about this each year that I buy tires during the spring rebates, the more I think that when on the fence with a heavier bike that I will ride loaded with bags like the VFR1200, how can it hurt to get the GT spec? Am I really going to feel too stiff a sidewall while out riding when the bike weighs 580 wet, I'm 220 with gear and I've got 20 lbs. of bags and luggage? No, BUT the non GT tires may indeed be a bit stressed and running hot. Well I'd be running about 90 to 100 lbs lighter so hopefully I've made the right choice. They arrive today. Found this quote days ago on another VFR board and this is also what tilted me towards the GT spec. "Called Michelin's US help line and they recommend the GT version on the VFR 1200 since it's load rating is a better match for the big VFR's weight than the standard PR-4's load rating." I agree with the choice you made for your bike. Just wondering if I should have done the same for mine. Judging by so many posts from so many people, you'll be fine. I wonder if Bridgestone has a useful customer support line? Their website states; "GT spec provides good handling and stability for heavy vehicles". Pretty vague.